A good Contacts list is precious; it’s more valuable than that snazzy office chair you covet or even that enviable cubicle near the coffeepot. 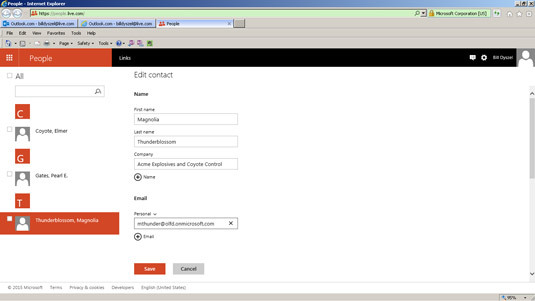 Outlook.com can help you keep your Contacts list up to date from wherever you are. For example, if you go to a conference or convention and exchange business cards with lots of people, you probably want to get those names into your Contacts list as soon as possible. Whether you’re using a laptop, tablet, or smartphone (or the nearest public library or Internet café), you can log on to your account remotely to enter all those new addresses before you go home. Click the icon beside Outlook.com on the Ribbon and choose People. The People (Contacts) application screen appears with your Contacts list. Click the New icon on the Ribbon. The Add New Contact dialog box opens. Fill in the blanks in the Add New Contact form. The information you type appears in the Add New Contact form. Save information about the people you know on the New Contact form. The Add New Contact form closes and the name you entered appears in your Contacts list. If you want to edit a contact you’ve entered, just open a contact record, click Edit on the Ribbon, and follow the same steps.